Brownells releases its Christmas line for preppers. Bulk-packed Federal XM80 7.62x51mm NATO 149gr FMJ is first run, first-quality ammo manufactured at the Lake City Army Ammunition Plant to Federal Cartridge Company specifications for commercial ammunition. 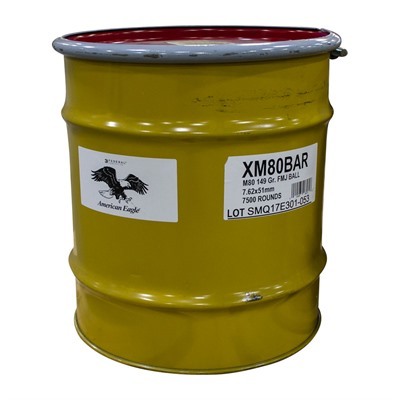 This round of Federal XM80 7.62x51mm NATO 149gr FMJ rifle ammo comes loose packaged 7,500 rounds in a barrel. I put out my feelers to the Federal employees I know. Yup, they've seen these. Nope, not discounted in the company store. If you're going to spend $4k on 7500 rounds maybe an extra barrel or two would be a good idea. My gut says this is how the contractor ships test ammo to the main Federal proving facility. Still, too funny.